A few years ago, some of the charedi Gedolim visited Teaneck. According to my sources, the background was that a certain Rabbi G., who was related to one of the Gedolim and a close talmid of one of my prominent opponents in Israel, was very upset about how the controversial ban over my books had brought ridicule upon the Gedolim. 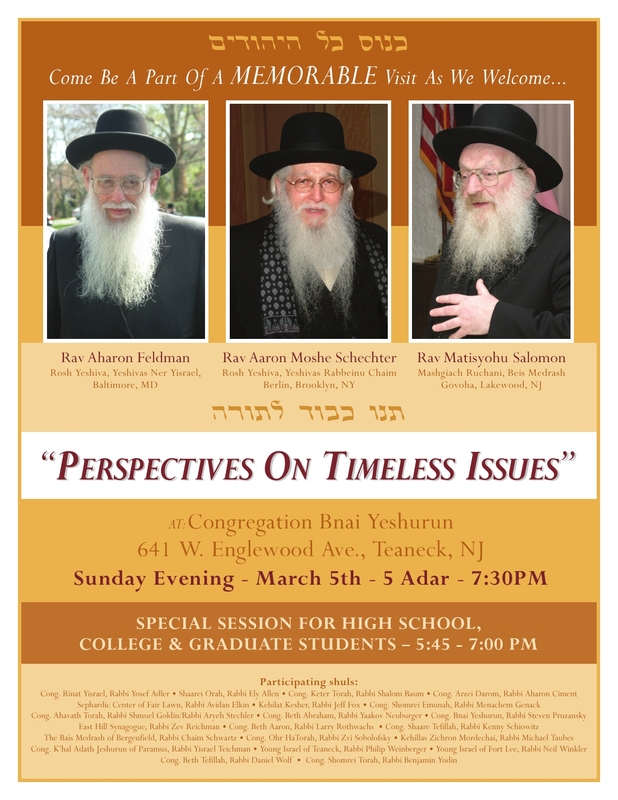 He therefore decided to arrange this event, in which the Gedolim would address the Modern Orthodox and answer some (carefully pre-screened) questions, in order to restore honor to the Gedolim. Many people, including myself, found it patronizing and offensive. The tone of the event was one of outreach, of the great Charedi gedolim deigning to visit the poor Modern Orthodox, who should give them adulation. Yet these rabbonim are people who disdain everything that Teaneck stands for. In a personal conversation with one of these Gedolim many years ago, he had some extremely harsh criticisms for Teaneck. I can understand the idea of building bridges between communities, but not in such a one-sided manner; it wasn't even as though they were speaking on a joint panel with rabbis from Centrist and Modern Orthodox communities. Of course, this was a satire (and consider it in light of yesterday's post on the pros and cons of satire). Some misinterpreted it as a mockery of these RIETS rabbanim, who would never be invited to Lakewood. But this was not the intent. The intent was to highlight the offensiveness of how the Charedi gedolim were being honored with an invitation to a Modern Orthodox community, and yet the invitation would never be reciprocated. I know what the intent was, because I was the one who made it. By the way, one of the RIETS roshei yeshivah featured in this flyer told me that he thought it was hilarious! I was just trying to explain the one of the big differences between UO and MO is the lack of reciprocity. This is perfect. I think you are mistaken in the purpose of this visit. IIRC, the purpose of the visit was simple bridge building. There was absolutely no condensation whatsoever. If the Teaneck crowd had felt that way, they would not have packed the Shul with standing room only crowds to hear these Rabbis lecture, nor welcomed them with songs of praise. Additionally, the questions were moderated by the Shul rabbi, if that is what you mean by pre-screened. I don't believe that the Rabbis had the questions in advance. IMHO there is are significant components of MO which are MO LITE (meaning to oversimplify- we really should be chareidi but we're weak and compromise to maintain the life style we want) or Chardal (meaning to oversimplify-we don't really want to engage the outside world anymore than we have to and we are bdieved doing so but would rather our children didn't). I'm not sure where those in MO pulpits fall but given the above 2 significant subgroups, it's not surprising that "the gedolim" would find a welcome in Teaneck that would not be reciprocated in Lakewood. Mamash a bizayon of Gedolei Yisroel! There was absolutely no condensation whatsoever. I'm glad to hear that there was no condensation - I guess there wasn't too much moisture in the air - but are you also claiming that there was no condescension? Considering that it was speakers who disdain Teaneck, speaking about their disdain for Teaneck values, in an invitation that would not be reciprocated, I think it was condescending. The fact that many people in Teaneck did not realize that, or have little confidence in their own ideology, does not change that. The Yeshiva world believes that they are on the correct path, hence they are not interested in hearing another way. The MO who are not so sure of themselves; hence they are open to hearing from both right-wingers and left-wingers. I thought the second poster was a riot. Bu imagine the shock of the Lakewood yunge leit had they discovered that these MO-- lo aleynu-- Roshei Yeshiva are actually outstanding Talmidei Hakhamim! Ironically, Rabbi Willig is known for his quip, "Teaneck shenishbah." But this is not surprising considering that only one of the people on your poster comes anywhere near representing modern orthodoxy. re only one of the people on your poster comes anywhere near representing modern orthodoxy. I recall this event, it was an embarrassment to our community (and most people don’t even realize that we were mocked with it). They were paraded into town and given all the pomp and circumstance they demand and not only has there not been any reciprocity, and not only has Rabbi Feldman, who is related the Rabbi G, published a book which bashes our values, we are so weak in our community that no MO Gadol has ever received such a welcome. Rav Aaron Lichtenstein comes to speak and there are no signs around town announcing it. Rav Druckman spoke a few years ago and very few people knew about it. We are so scared and embarrassed of our own accomplishments and so busy looking over our “right” shoulder that we do not appreciate what we have and we damage ourselves by showering such great honor on people who would like nothing more than to see us give up our life styles. It is sad and pathetic. Parenthetically, last year Rabbi Solomon was invited back in town and the same supposedly MO rabbonim who did not show up to hear Rav Aaron Lichtenstein were tripping over themselves to make it to the dais at this event. So sad (and pathetic). Actually, it's just the opposite. The MO are confident in their approach, hence they are able to also be open to accepting what others have to add. The Yeshivah world is extremely insecure, and are thus terrified of acknowledging that anyone else has anything of value to offer. There must be a reason why the host crowd thirsts for and appreciates and honors the Yeshiva rabbis. I was there at the standing room only event and was amazed at the spontaneous singing which accompanied the entrance. Perhaps the residents should pay similar homage to their own leaders. I would be interested if anyone has footage of the discourse Rav Schechter gave, or the Q&A sessions. The tirade seen in the clips above was an anomaly compared to the rest of the presentations. "Ironically, Rabbi Willig is known for his quip, "Teaneck shenishbah." But this is not surprising considering that only one of the people on your poster comes anywhere near representing modern orthodoxy." If your definition of modern orthodoxy means being not serious about halacha then perhaps you are correct that these roshei yeshiva do not represent that, but according to the general definition modern orthodoxy keeps the rigors of halacha with a more open minded outlook on the world in general, which for sure these roshei yeshiva represent. Growing up in teaneck myself, I know exactly what Rabbi Willig is talking about. While a lot of teaneck is shomer halacha and very sirious in their judaism, there is a section there that definitely is distorting modern orthodox values, and that is what he is reffering to. These visits by chareidi gedolim to Teaneck sometimes backfire because they sometimes make statements that are so inconsistent with the religious values of the community. That is what happened with Rav Aharon Schechter. A much more egregious example occurred when Rabbi Dovid Cohen came to town for a Shabbos. He publicly said that one can engage in tax evasion as long as you will not get caught and he then said that he would deny his statements if he were to be quoted. He then privately said afterwards that he holds that gezel akum is permissible as long as you will not get caught, and that the psak to the contrary in the Shulchan Aruch can be ignored because he presumed that they were just put there because of fear of the goyim. These views are completely contrary to the religious values of the Teaneck and Bergenfield community and caused people to lose respect for him. I have a question for the Teaneck people. Does the oylam there like the content of Rav Schechter's or Rav Solomon's lectures? Does the adoration go beyond platitudes? Do people thing it's awesome? Do the discuss what they heard a day, a week or a month later? If so, what specifically do they like? I come from charedi background and am living in a charedi style, so I really don't know what goes on over there. Obviously, I would not be interested in this stuff, but what do they like? I uploaded quite a lot of it onto YouTube. Just search for "The Gedolim visit Teaneck." I haven't gotten around to uploading all of it. Carol to answer your question, I lived in teaneck my whole life, and the reaction that I generally heard was one of intense disappointment about the gedolim's responses to the questions. People said that they did not really give convincing arguments or answers, and seemed much less thought out and convincing than many of the approaches that modern orthodox hashkafa takes on these issues. The reason that we give them so much respect is because we recognise their greatness in torah even though we disagree with their worldview. Sadly enough (as R' slifkin points out) the charedim cannot seem to respect our gedolim for their torah knowledge and just ignore their conflicting worldview. If thousands show up to hear a Rav Feldman, and a handful shows up for Rabbi YU, that is clear enough evidence that the olam reveres the true Gedolim, and is further evidence that they are, in fact, the true Torah authorities. Numbers have meaning. Maybe because of my background, but when I hear words like this I feel like making a real riot. Like taking off my shoe or a soda can and throwing it at the speaker. BA, thanks. If this is the case why invite them? Where is the Torah knowledge? Gemara? So invite them to give a shiur in Gemorah but why ethics or Jewish thought? Agree. However, the meaning of the numbers can be properly evaluated by knowing the content of the lectures. Gosh, I hope not. There are about 3 billion Christians and Moslems, and only a few million Jews! "BA, thanks. If this is the case why invite them? Where is the Torah knowledge? Gemara? So invite them to give a shiur in Gemorah but why ethics or Jewish thought?" I am speaking after the fact now that it seems that there cannot be "civil" dialogue about such topics I would wholeheartedly agree that they should not be invited to discuss jewish thought topics but only be invited if they will stick to strictly non controversial topics. It is a preposterous to have people that ridicule your philosophy come discuss topics about it. Its one thing if cogent well thought out arguments were made against certain MO ideas, then it would not be such a big deal, but the ranting and sarcasm and condescending nature of the whole event was a major turnoff. Having numbers means you have the masses, thats about it. Having the masses is not really a sign of credibility or correctness, in fact probably the opposite is true. The very large attendance,I'd bet, was due primarily to curiosity and the novelty of the event - if not for the opportunities for juicy tale-bearing and controversy. The olam wasn't disappointed about the latter point. From the anecdotal reports, it would seem that few converts were made. It is incredible that some rosh yeshiva imagines that shouting will help persuade those who don't automatically put him on some kind of pedestal. And 50 Million Elvis fans can't be wrong. I don't think content makes a difference. They show up just to breathe the same air as the Gedolim. And that is a proper thing to do. It would be worth it to spend a thousand dollars on a plane ticket just to see the back of Rav Shteinman for a minute, just to be able to tell your children and grandchildren you were in the same room! 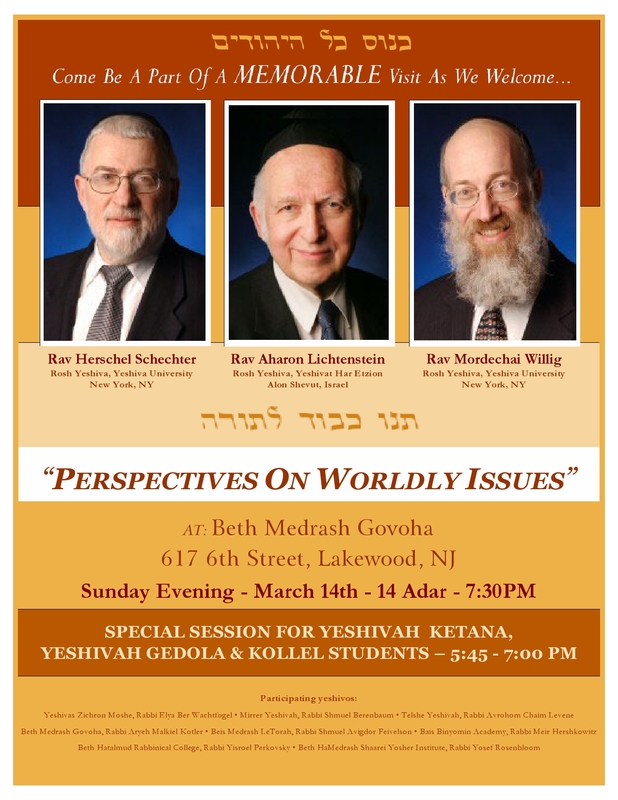 The very fact that people thought that the poster of the YU Rabbis speaking at Lakewood was a mockery of the *YU Rabbis* shows the contempt with which everyone recognizes that the MO are held in the Haredi world. Its truly sad that we MO have so little self-confidence that we have to give kavod to Charedi Rabbis who reject us and expect own own leaders to imitate (in appearance and manner) the Charedi style instead of adopting our own model of leadership that reflects our values. Observer, it is all a matter of what our rabbonim and so called leaders are promoting and finding the right rabbonim for the community. In the shuls where the Rav heaps praises on Rav Aaron Lichtenstein and Rav Moshe Lichtenstein and advertize the events people show up. Where they push and promote and quote the charedim and never even give lip service to someone like Rav Aaron Lichtenstein or Rav Kook but have no issue quoting rav olyashiv when speaking about having an open mind you have to wonder about their motives. Unfortunately there are too many Rabbonim serving in Modern Orthodox communities who try to push a charedi hashkafah on their community and shul and they end up bringing in rabbonim who say it is ok to cheat on your taxes and an embarrassing reaction from many members of the community. I think it has a lot less to do with “true authority” as you put it and more to do with marketing and the charedim are winning on the marketing side. Who has the “true authority” I can’t say for sure but I don’t think a life of learning and poverty for tens of thousands, and the divisiveness and machlokes that has been created by the so called “torah true” (charedi) community is what the chachomim had in mind. "If your definition of modern orthodoxy means being not serious about halacha then perhaps you are correct that these roshei yeshiva do not represent that"
No; I said only one comes close. Did you have a particular one in mind who isn't serious about halachah? So I see that Chareidi (contemporary Yeshivish)=Lakewood values of the past few decades. Ok so Chassidim can be a tolerated minority with views alternately welcomed and ignored by the Chareidim, but Rabbi what's with the Chareidi Sephardim? Are their present authorities in the in crowed or out crowed? "Gosh, I hope not. There are about 3 billion Christians and Moslems, and only a few million Jews!" There isabsolutely no reason to believe that the haredi gedolim have any more Torah knowledge than the mnodern orthodox ones. Everyone stops to stare at the accident on the side of the road. It was rubbernecking. Nothing to do with valuing these over those. People like the strange and exotic. If a squirrel was in the street, no one would go and see. An exotic bird, everyone would check it out. Mike, please explain your comment. I am not sure what you mean. Thank you. If numbers have meaning then we should all be pagans or buddhists since there are 2 billion chinese and 1.5 billion indians. The truth is numbers are Worthless, the truth has meaning. That is what any real Jew thinks, otherwise, they wouldn't be Jewish. Someone who thinks numbers have meaning outside of Bais din is an ignoramus. If numbers had meaning then all the Jews should have been killed in Egypt not just the 4/5ths majority. Numbers just show that the masses follow the masses. Quantity has a quality all its own? Maybe. By that standard we should all be Christians or Muslims. The Sun went around the Earth until enough people believed Galileo. I don't think you want to follow this line of reasoning too far. Arguing with an irrational person is a waste of time; so is arguing science with someone uneducated in science. That angry rabbi in the video seems to think a strong offense is better than a weak defense. Attacking his audience as heretics only did damage to the cause of Jewish unity and brotherhood. Rabbi Willig is very far from MO. His general attitude toward halacha as well as his tone of voice is distinctly yeshivish. I actually once heard him give a lecture in which he seriously entertained the notion that one cannot say "St. Nicholas Ave."
Rav Schechter is a bit more complicated. His humility is amazing (unlike most yeshivish "gedolim") and he is a Zionist. He also believes that it's good to work for a living. However, he doesn't really subsribe to the idealism behind Torah uMada. I heard him say so publicly. Even if you hold that gezel akum is mutar I have difficulty understanding how that extends to a heter for havrachas meches in the artzos habris where such activity constitutes gezel from everyone including felllow yehudim. The second Poster Shows exactly what is wrong with the Yeshivish mindset of BMG when it comes to dealing with MO and of course the Talmidei Chachamim of YU. That is exactly how i expected him to answer,but seeing it was still funny. Was wondering the reason you prefer not to elaborate on the full name of "Rabbi G"
I have some reservations on Rabbi Schechter's response. First, I donot believe that any scientist whould have given an answer as the one Rabbi Schechter is claiming to have received to his question. (who caused the big bang?) Second, The Rabbi answered so uncivilized yelling and ranting without respect for the questioner. I am sorry to say but if this is your idea of a gedol, I totally disagree. He who dose not honor his followman is not worthy of honor. Avot. There are explicit Gemarahs that allow tax evasion. GEzel Akum is a seperate issue, which prohibits Gezel only. Related Isurim would have to stem from Chilul Hashem, which supposedly dosen't occur if you're not caught. Besides, When a Chareidi Rabbi comes up with such a liberal Psak, which even provides you with Schar in Olam HaZeh, I wouldn't argue. I don't think you w"
This is a silly argument. We are not talking about Truth claims, we are talking about Respect. If you want to know who is more repsected, then yes, numbers mean thing... by definition! Muhammed is More Respected than the Pope. Jesus More than the Pope, but less than Mohammed. Moses is Respected the most. Moses/Buddha likely respected equally. Yehuda said- "Rabbi Willig is very far from MO. His general attitude toward halacha as well as his tone of voice is distinctly yeshivish. I actually once heard him give a lecture in which he seriously entertained the notion that one cannot say "St. Nicholas Ave."
"But this is not surprising considering that only one of the people on your poster comes anywhere near representing modern orthodoxy." "If your definition of modern orthodoxy means being not serious about halacha then perhaps you are correct that these roshei yeshiva do not represent that, but according to the general definition modern orthodoxy keeps the rigors of halacha with a more open minded outlook on the world in general, which for sure these roshei yeshiva represent." MO in my opinion is about the Torah being elastic and able to change. Tzedukim are stuck on literal interpretations, Perushim give interpretations based on worldview, society and underlying Torah ideals. That said the oral law is not facts stated to Moshe, rather permission to explain it based on changing times and values without contradicting it out right. Haredim have turned the Talmud, certain Rishonim and Achronim into the "written law" of the Tzedukim. This being said you can judge for yourselves if R' Willig, Shechter and Lichtenstein are MO or not. I have some reservations on Rabbi Schechter's response. First, I donot believe that any scientist whould have given an answer as the one Rabbi Schechter is claiming to have received to his question. (who caused the big bang?)" What caused the Big Bang, not who, but the presense of a who for the answer or the presense of something beyond the physical may have been behind the comment of the scientist. Yes it does sound believable especially if a scientist is honest with himself and if this scientist felt that the answer was outside of science he may have truly felt that as a scientist he needn't give a reply and as a human being for sure, he did not want one. "Rav Schechter is a bit more complicated. His humility is amazing (unlike most yeshivish "gedolim") and he is a Zionist. He also believes that it's good to work for a living." Well when I was there Yeshiva students went to college with the full permission of the Yeshiva. As for Chalav Yisroel, that wasn't for the snack machine where anyone could select what they wanted, whether Chalav Yisroel or Chalav Stam. This is the ikar problem, no respect for Gedolei Yisroel. You think it's funny that he was upset? You are a letz. This is the ikar problem, no respect for Gedolei Yisroel. You think it's funny that he was upset? You are a letz." This leads back to the question of mocking raised by Rabbi Slifkin. All too often it is done with the intention of saying in effect I can show I'm right without any serious thought by reducing the other side to nothing. Of course that strategy usually indicates that serious reflection has been replaced by quick judgment. Reb Aharon Schechter can be wrong and you too but he can look at worst stereotypically reactionary here while if you handle mocking wrongly you can look stupid even if you are right. It is just another post which shows N'Slifkin doesn't get America.America is open. If R'Willig or even R'Schachter would come give a shiur in Lakewood(though not their official capacity)it would barely cause a stir. When R Shechter makes an Irrational statement in a way which i think is inappropriate and harmful to Orthodox Judaism. I will ridicule his statement,and even laugh,perhaps. It is because of the Kavod of OJ and the Torah that i ridiculed his answer. here is(part)of what Isaac wrote on that comment page. I am not ridiculing R Shechter the Talmid Chacham,Rather the inappropriate manner of his answer,I really think he could and should have done better. The answer he gave and the way he gave it is a classic example of what is wrong with Chareidi Fundamentalists. Nevertheless i am nor ridiculing his Torah Scholarship,i hold him in very high esteem. Although i will right future comments in a way which i hope cannot be seen as a personal attack on a Talmid Chahcam Chas VeChalila,because i can definitely see how my previous post made it seem like i was making fun of R Shechter,and i would like to Apologize for not thinking things more thoroughly before posting them. Trex, are you an orthodox jew? the gemara also quotes a view that says that you can eat chicken and milk. orthodox jews follow the shulchan aruch and that says that tax evasion and gezel akum are pohibited. No one naturally speaks in a yeshivish voice and no one who would want to sound half distinguished ever would speak with a kvetch. A MO approach to halacha is neither meikel or machmor. It is, however, supposed to be somewhat "normal." And seriously suggesting -- without even a hint of embrarasment -- that saying "St. Nicholas" is assur is both silly and moez laaz on all the very Orthodox Jews who say things like St. Louis all the time. Rabbi Willig also by the way (in the same lecture) indicated that listening to much of classical music is assur. Is that MO too? Should we ignore all the rabbis and Orthodox Jews who went to classical concerts? Or should we nonchalantly imply that they were all sinners? "The intent was to highlight the offensiveness of how the Charedi gedolim were being honored with an invitation to a Modern Orthodox community, and yet the invitation would never be reciprocated." Since when are there "Charedi gedolim" and "MO gedolim"? There gedolim period. There is no need to sectarianize it. And once you recognize that point, there is nothing to talk about "reciprocating", as there are no 'sides'. It seems as if we are talking about 2 different R' Willigs. If you listen to the shuirim that he has on YU torah, or his essays in the Torah Umadda Journal a very different view of R' willig will come to light. I really do not think that one questionable shuir is more reliable then the massive corpus of lectures that paint a very different portrait of his worldviews and hashkafa. Furthermore Im not sure why you are obsessed with the this "yeshivish voice" thing. It seems very superficial and immature on your part, and (even if it is true that he speaks like that, which is debatable)really bear no relevance to his hashkafa and degree of open-mindedness. Also if you reject R' Willig and R' Schachter as Modern orthodox poskim, pray tell who's psak do you follow? In response to YA's comment on March 8, 2011 3:22 P.M. Yes, Rabbi Schechter did say that he asked "what" caused the big bang? But we all know that he ment "who" and according to the Rabbi the scientist's answer was "I don't want to think about it." This is all semantics - who or what. But about your view on scientists. You express only an assumption. And here is why I cannot believe the Rabbi's claim that he received this answer. For Albert Einstein said. "Everyone who is seriously involved in the pursuit of science becomes convinced that a spirit is manifest in the laws of the universe." It is a fact that, all prominent scientists adapt to this premise. Furthermore, Rabbi Schechter was asked to give an answer on a subject that is a matter of great importance to the study of Torah. After all the agenda at this meeting was "Perspectives on Timeless Issues." The author of the question was expecting the Rabbi's perspectives to his enquire, not to be insulted and to be made to feel sorry for asking. We see in Torah study (e.g. Gemara) that all questions (even of a atheistic nature) is encouraged, so why not here? Perhaps I have misunderstood the gemoro, but at the bottom of Megilla 25a, it asks why the mishnah needs to tell us that we are permitted to both read and translate Maaseh B'reishit. "Pshito!" the gemoro contends. It then answers that indeed there IS a hava amina to suggest that one might not translate it due to the difficult questions that might arise, nevertheless ko mashma lan that we can. Afar ani tachas raglov, but in other words, isn't Rav Shechter's empotive response here to the question of examination into Briyas Haolam precisely the hava amina of the gemoro (i.e. decent svoro), but one that is ultimately flatly rejected?! Finally got a chance to view the video. I was put off by the method of delivery, an over-the-top fairly angry rant, but I didn't take offense at the message, which I think had a clear point -- that one ought to know shas a little better, and worry more about what one is clearly chiav al pi Torah to know and to do. I tend to gravitate more to my Slifkin books rather than study of shas, so I don't mind the chizzuk in that area. Yes, Rabbi Schechter did say that he asked "what" caused the big bang? But we all know that he ment "who" and according to the Rabbi the scientist's answer was "I don't want to think about it." The Rabbi did not ask the question of the scientist. The Rabbi said that this one involved in fiber optics asked the question of the scientist. "This is all semantics - who or what. But about your view on scientists. You express only an assumption. And here is why I cannot believe the Rabbi's claim that he received this answer. For Albert Einstein said. "Everyone who is seriously involved in the pursuit of science becomes convinced that a spirit is manifest in the laws of the universe." It is a fact that, all prominent scientists adapt to this premise." First of all then Einstein was saying "Everyone who is seriously involved in the pursuit of science becomes convinced that a spirit is manifest in the laws of the universe." Not every prominent scientist thinks so deeply about the foundations of the universe or even works that deeply in science to do so and what Einstein would call seriously involved in science may leave many a prominent scientist found wanting. I wasn't making an assumption. One has a slew of scientists to poiint to, Steven Weinberg explicitly. If you’ll forgive me for quoting a prominent atheist, the video reminds me of something Daniel Dennet has said. When it comes to science, while you may not understand a particular theory, you can be confident that the experts in that field do understand it. When it comes to religion, the experts don’t understand it, and not only don’t they understand it, but they make a virtue of not understanding. While I may disagree with some of your conclusions, I can live with rationalists because we have basically the same epistemology. Though it occurs to me that the fact that someone like myself can find so much to agree with in your worldview may be precisely why it is so roundly condemned by Chareidi authorities. That's an inaccurate generalization. There are some people, such as Rav Schechter, who make a virtue out of not attempting to understand it, but there is a much longer tradition of rabbinic scholars trying to understand as much as possible. > That's an inaccurate generalization. Yes, of course it’s a generalization. And it’s (somewhat) inaccurate for Judaism because it’s a generalization of ALL religions. But it fits the video perfectly, no? If you’ll forgive me for quoting a prominent atheist, the video reminds me of something Daniel Dennet has said. When it comes to science, while you may not understand a particular theory, you can be confident that the experts in that field do understand it. When it comes to religion, the experts don’t understand it, and not only don’t they understand it, but they make a virtue of not understanding." If so Dennet is confusing not picturing concepts that defy pictures with glorying in ignorance. It would be like saying if a scientist can't picture spacetime as it really is and says we can't do that because we picture space and time to be seperate he is glorying in ignorance and is saying meaningless things. Dennet is being then ignorant, woefully and patently ignorant. He really expects that no expert on religion is an expert?! They are all stupid or not brilliant?! If your quote is accurate Dennet souinds here incredibly out of touch with reality. Perhaps he claims if you can't picture something it doesn't exist. The analogy is comparing apples and oranges - the physical and the metaphysical. Einstein doesn't have to be an expert on the 'manifest spirit' nor does he claim to be, the religious leaders are expected to know the Divine Truth and they claim to do so. Do they? If so, what is it? The comparison is awesome because it brings out this difference. In a comment on this thread that was never published I was asking what R. Cohen thinks is the purpose of Judaism as a religion if he advocates tax fraud and gezel akum? If I were in Teaneck attending his shiur I would have asked him this question. In response to YA's comment on March 10, 2011 4:09 P.M. YA said.... "The Rabbi did not ask the question of the scientist, the Rabbi said that this one involved in the fiber optics asked the question of the scientist." Again your argument is based on semantics, who did the asking. Mine is, if the Rabbi is creditable in his statement. And here is another reason of why I cannot accept the Rabbi's statement as fact. The Big Bang Theory is a testimony to the trueness and validity of the Torah, that it is in itself a testimony that there was a beginning. (Bereishis) Well known for this in the scientific community. In fact because of this, many in the atheistic community at first refused to accept the Big Bang Theory. So for the Rabbi to say, that the fellow who proved the Big Bang would answer to his friend of fiber optics, "I don't want to thing about it" without engaging in a dialogue, is hard to swallow. There are many scientists who make contradictory statements on religion that would cause many people to believe that many of them are not convinced that a spirit is manifest in the laws of the universe, as Einstein has stated, for example, A truly prominent scietist, Prof. Stephen Hawking's in his most famous work, his 1988 book, A Brief History of Time; Wrote, "If we discover a complete theory, it would be the ultimate triumgh of human reason-- for then we should know the mind of God." And yes you can find atheistic statements from him as well. To say that many prominent scientists would not give credence to Albert Einstein's opinions, is a self detrimental statement. And finally, If a scientist dose not think deeply about the foundations of the universe or dose not work deeply in his scientific endeavours, I ask you, how prominent can he be? > It would be like saying if a scientist can't picture spacetime as it really is and says we can't do that because we picture space and time to be seperate he is glorying in ignorance and is saying meaningless things. It’s not like that at all. It’s like the scientists saying, “Who are we to try and understand spacetime? It’s wrong to try, and anyone who wants to understand spacetime is arrogant and should get back to what’s really important. > He really expects that no expert on religion is an expert?! I think that may actually be true of many gedolim: they’re experts on gemara, or halacha, but not on Judaism. > To say that many prominent scientists would not give credence to Albert Einstein's opinions, is a self detrimental statement. > If a scientist dose not think deeply about the foundations of the universe or dose not work deeply in his scientific endeavours, I ask you, how prominent can he be? Science is not a monolith. Why would, say, a sociologist think about the foundations of the universe? And why would he be concerned with the opinion of Einstein the physicist? I do know HaRav Aharon Schechter and this is his style of speaking when he wants to make a point, regardless of the topic and almost allways in a venue where he feels comfortable. He can be equally animated when discussing a Mahara"l or an Acharon in a shiur. It is his way of expressing passion about a topic, not displeasure or anger. Unfortunatley, without prior experience with him, this may not be appreciated. He believes that the Torah was specifically vague and "un-useful" in describing the origins of this world, in essence hiding the reality. To dwelve into these matters, at least from an analysis of TaNaCh, is inappropriate, and is similar to a child peeking behind his parents bedroom door. This view can be read into Chazal (Chagiga, et al). Also, it is a question of exegesis: A day means a day, just as endless generations interpreted it. This is so regradless of historical reality (Rav Kook pointed out in his letters that the Torah is not for history,it is for moral education). What Rav Shechter finds hashkafikly offensive is changing the meaning of the words to fit our modern conception of what the words should mean. These points are rather subtle, that briat ha'olam is like leidat ha'adam, and that they both require a certain level of privacy, and that words have literal meaning regardless as to whether they accuartely decscibe events. You have made this point repeatedly regarding Chazal. One can freely disagree with him, but but I do believe he was misunderstood, both as to what he said and how he said it. The fault may be his, but halacha is clear that when it comes to a Talmid Chacham we have to extra respectful, and surely try to pay more careful attention to his words. YA said.... ""The Rabbi did not ask the question of the scientist, the Rabbi said that this one involved in the fiber optics asked the question of the scientist." So for the Rabbi to say, that the fellow who proved the Big Bang would answer to his friend of fiber optics, "I don't want to thing about it" without engaging in a dialogue, is hard to swallow." The Big Bang happened even if God would not have created scientists to verify it. In fact God would have created science even if He would not have created scientists. A question for Evolutionists who conflate the two is did science depend on the evolution of man to exist? So how a scientist reacts to a question that could be claimed to be outside his field and God at least is, ought to cause no challenge to your assessment. "And finally, If a scientist dose not think deeply about the foundations of the universe or dose not work deeply in his scientific endeavours, I ask you, how prominent can he be?" If he doesn't think deeply about the foundations of the universe it will affect his work and prominence. Dawkins for instance while no doubt able to tell a zebra from an ape is impressive in discussing the foundations of the universe if being bombastic and self serving in argument is a mark of genius. One can work superficially more in science or less. One can tread down the beaten path of his field and say that's all there is or think more than superficially concerning science. "It’s not like that at all. It’s like the scientists saying, “Who are we to try and understand spacetime? It’s wrong to try, and anyone who wants to understand spacetime is arrogant and should get back to what’s really important." If that's what Daniel Dennet is saying then it doesn't help your case. Perhaps you were thinking I was talking of Rabbi Schechter.